Posted on 05 July 2016. 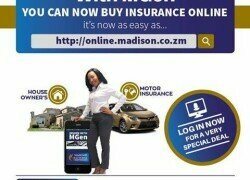 We make reference to the article which was published in your newspaper on Saturday 2 July 2016 Page 8 under the headline “Madison Insurance poor service delivery”. Management has taken note of the concerns and 0bservations made by the ‘Concerned Customer’ and wish to assure our policy holders that adequate measures have been put in place to address incidences of power outages. Further, we would like to take this opportunity to assure our customers that our primary focus is to deliver superior quality services and products, hence our investment in an enhanced digital platform to create the desired level of efficiency. In ending we wish to thank the ‘Concerned Customer’ for bringing out areas requiring our attention to improve service delivery. Naturally, we encourage our genuine policy holders, as many do, to visit out offices and share both complaints and compliments with us.